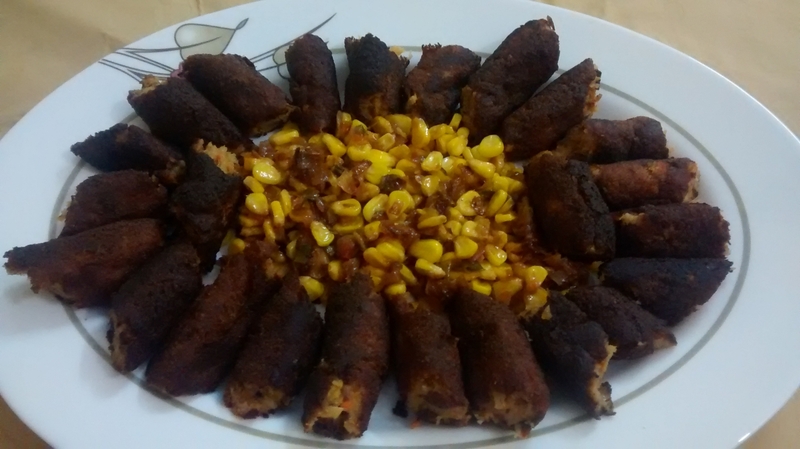 Welcome the new year with these delicious and easy to make soya kebabs. Kebabs offer a refreshing change from the usual cutlets and add glitter to any party or get-together. Now make these restaurant style kebabs at home and impress family and friends. Mash the potatoes in a large bowl. Drain water from the soaked soya chunks and squeeze them to dry them up. Then place them in a grinder and coarse grind. Add ground soya and grated carrots to the mashed potatoes. Also add salt, red chili powder and crumbled soaked bread. Combine everything and then shape into sausages (thin and long). Place a deep frying pan over medium heat with a little oil in it. There should be enough oil to fry the kebabs but not enough to deep fry them. Once the oil heats up, carefully place the sausage into it. After a few seconds using a slotted spoon, roll the sausage over to evenly fry from all sides. Take care not to deep fry the kebabs or else they won’t turn out soft. When done, transfer to a plate lined with paper towels. Let them cool a bit and then slice the sausage into bite sized kebabs. To make corn salad, combine the sweet corn with salt and lemon juice. Plate up with the corn salad in the center and the kebabs circled around it. Serve hot.